Information from and about the Library’s Board of Trustees. Now is your chance to tell us how we’re doing! It’s Customer Satisfaction Survey Season at the Huntingdon Valley Library. Based on last year’s survey, we are happy to announce that Sunday Hours are coming in 2016 (maybe as early as late January). Feedback is shared with the Board of Trustees and ensures we provide the services, collection and programs you expect. 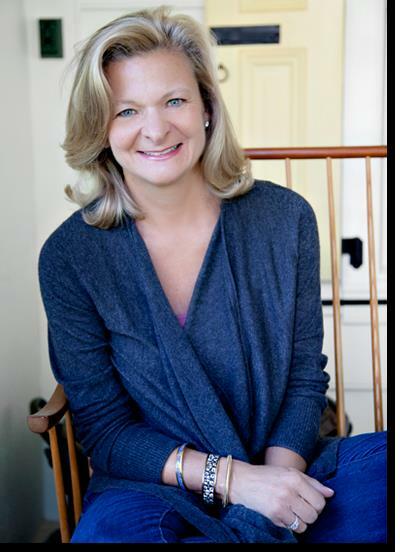 Lisa Scottoline is the New York Times bestselling author and Edgar award-winning author of 22 novels, including her latest, Betrayed, which released in November 2014. She also writes a weekly column with her daughter Francesca Serritella for the Philadelphia Inquirer titled “Chick Wit” which is a witty and fun take on life from a woman’s perspective. 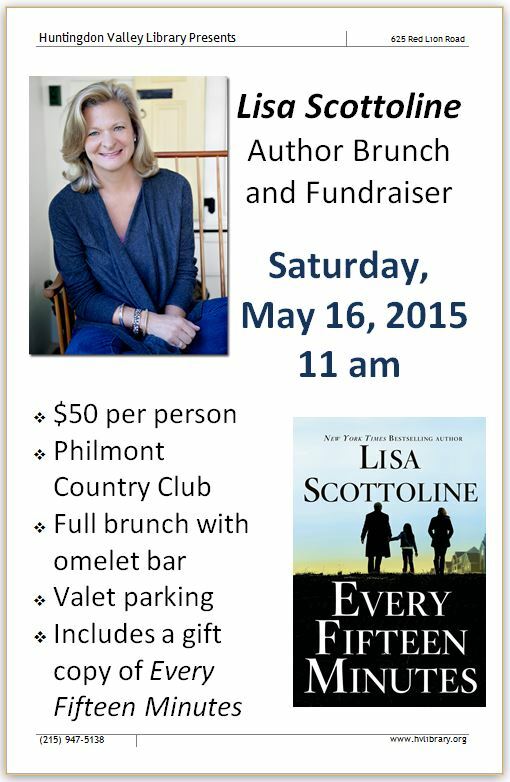 Lisa will be speaking at a brunch fundraiser for the library. Seating is limited to 200. We have started a wait list as of April 20, 2015. Each guest will receive a free gift copy of Every Fifteen Minutes. Thank you. Your support allows us to write the Next Chapter of the Library’s story. The Friends-supported Summer Reading Program improved student reading skills over the summer. This year’s 7-week program included 31 science-themed events for over 1,400 kids and families! Buy your ticket online today or stop by the Library with cash or a check, payable to “Huntingdon Valley Library”. Cost: $50, includes food, wine and gratuity. After the event, the Library will send attendees a letter with details about the tax-deductible portion of each donation. All entrees are served with vegetables, the Library will supply a dessert and the Board of Trustees is providing all of the wine. 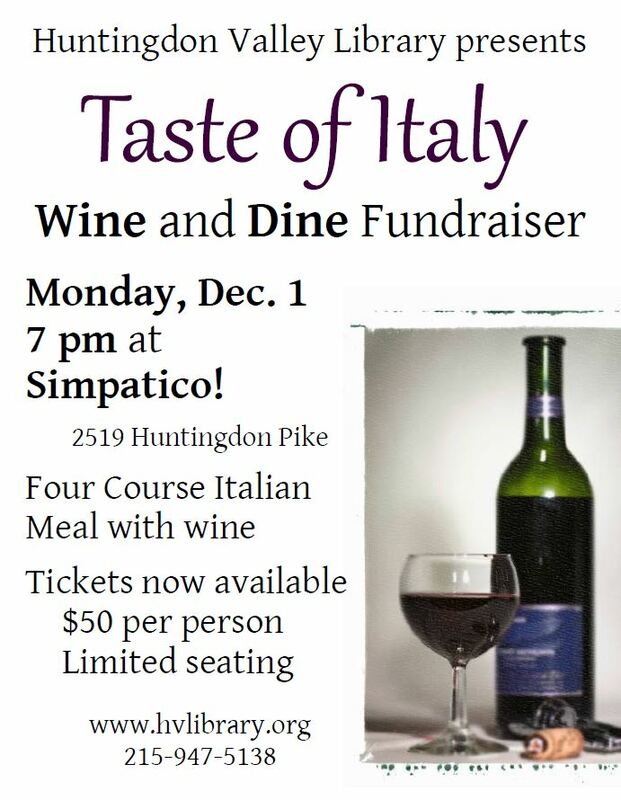 We will pair interesting Italian wines with each course and have information on the wines served. Library Leadership Wants to Hear Your Voice! 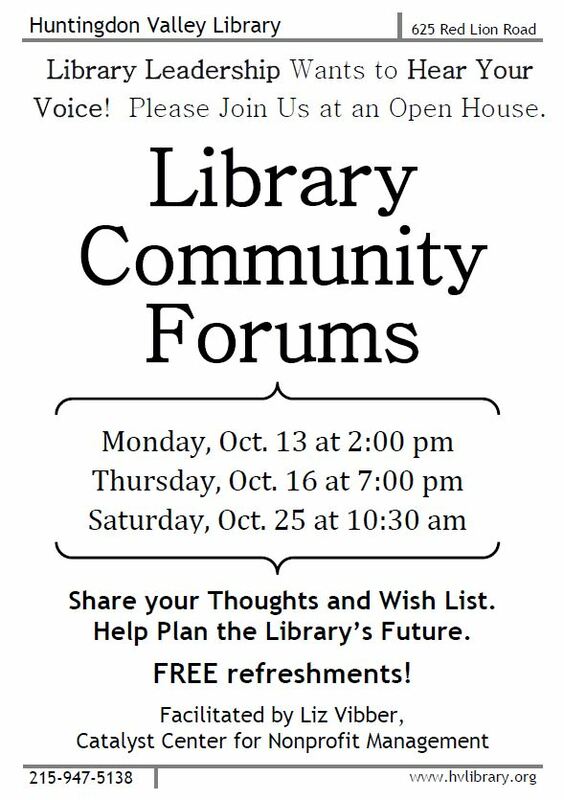 As members of the Library Board of Trustees work to craft a new Strategic Plan for the Library, they invite you to share your ideas, concerns and vision for library’s future at a Community Forum. Your valuable input and feedback is vital to the planning process! We want to hear YOUR voice. This discussion, facilitated by Liz Vibber of Catalyst Center, will explore the themes and issues brought up in the Customer Survey and interviews with key stakeholders from the surrounding community. Each forum will be approximately 1-hour long, with refreshments and chances to win door prizes! We want to thank everyone who participated in the first two Forums, as well as the Teens who came and shared their creative ideas and insights. As of Oct. 18, we had 250 responses to the Customer Survey. The drawing for a Samsung Galaxy Tab 3 Lite ended Oct. 17, but the Survey will remain open until Oct. 25. Thank you for your time and opinions. The Board and Staff work in concert to provide the residents of the Lower Moreland Township and Huntingdon Valley Library users with great Library services. Your feedback helps ensure we continue down the right path. If you run into any problems or would prefer to complete a paper survey, contact me at 215-947-5138 or by email at hvldirector@mclinc.org. The Huntingdon Valley Library Board of Trustees invite you to share your thoughts with them through an online Customer Survey. 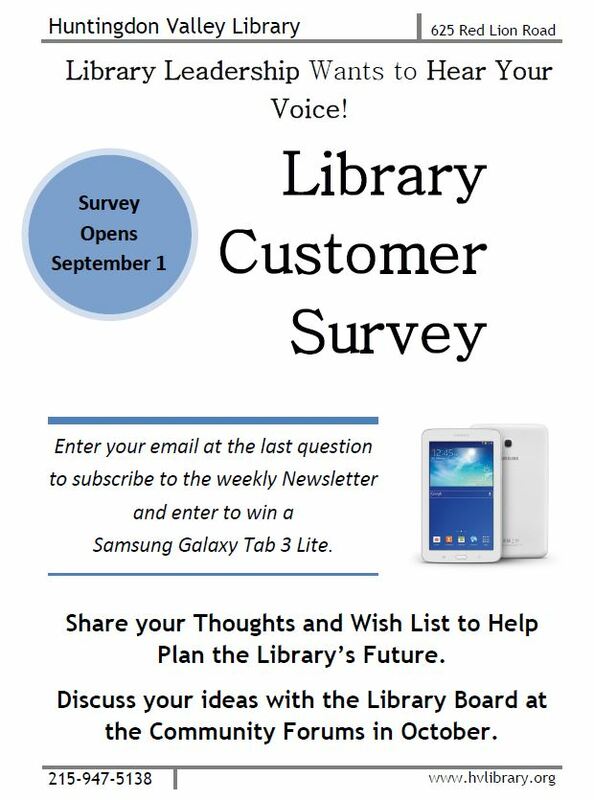 As an incentive to share your time and opinions, you can enter to win a Samsung Galaxy Tab 3 Lite tablet computer by sharing your email address once you complete the survey. Before crafting a new three-year Strategic Plan for the Library, the Board is gathering valuable input and feedback from the Community. This Survey is one of several steps the Board is taking to listen to you! They hope to hear the ideas and insights that will help shape and inform the Library’s future. The Board is also engaged in interviewing Community members and they invite you to participate in one of three Community Forums in October. These facilitated discussions will explore the themes and issues brought up through the Survey and interviews. One final question that will enter you to win a Samsung Galaxy Tab 3 Lite. Thank you for your time and opinions. The Board and Staff work in concert to provide residents of the Lower Moreland Township and Huntingdon Valley Library users with great Library services. Your feedback helps ensure we continue down the right path. If you run into any problems or would prefer to complete a paper survey, contact me at 215-947-5138 or by email at hvldirector@mclinc.org. Did you know? 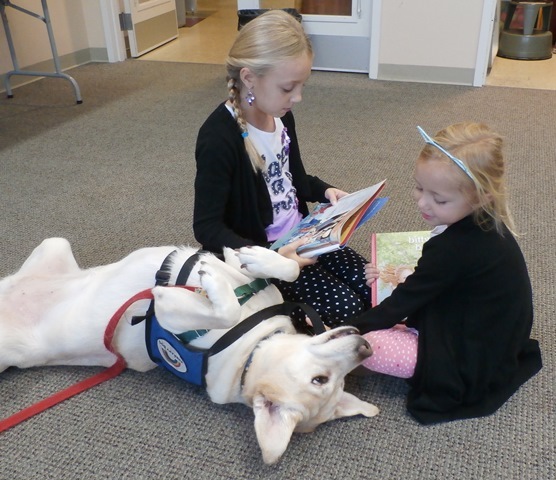 The Huntingdon Valley Library, a non-profit library, receives the majority of our funding from the Lower Moreland Township. This local support covers our basics: staff, utilities, insurance, and administrative expenses (like bookkeeping). With individual donations from supporters like you and on-going support from the Friends of the Library, we are able to enhance the collection, improve our technology and bring in quality speakers, like Gerry Shur, Ruth K. Hartz and Dr. Isser. Donations to the Library may be tax deductible. We also welcome memorials and will provide a personalized book plate for any donation over $25.00. For more information about how you can donate to the Library, visit the Donate page at hvlibrary.org. To make your payment online, fill out the online donations form. Once that is submitted, use the button to make a payment. Be sure to specify your name and purpose so that we can match your form to your payment.